Summary: The design, installation and extraction of a temporary Pipe Trench Cofferdam and associated Safe Haven as part of Anchorsholme Long Sea Outfall Cofferdam project. 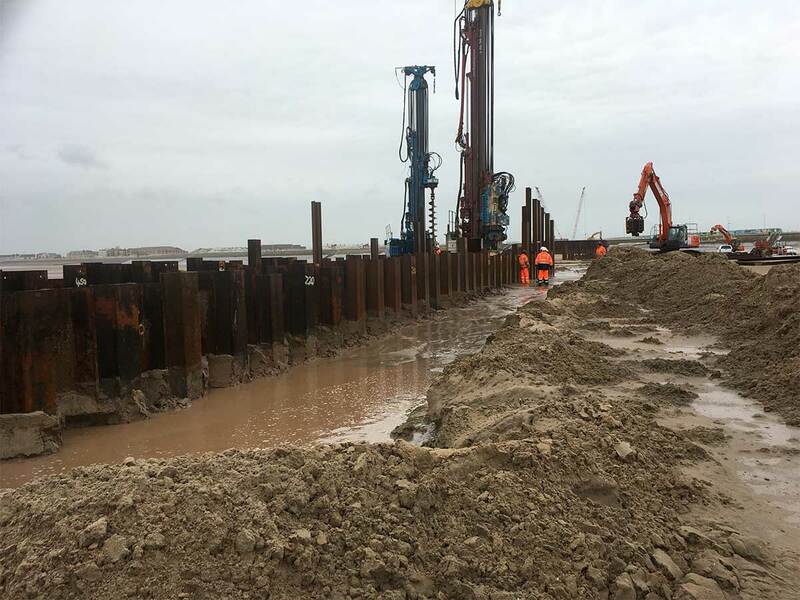 Sheet Piling (UK) Ltd were employed by J Murphy & Sons Ltd specialist marine division (formally know as Land & Marine) for the design, installation & extraction of a Temporary Pipe Trench Sea Outfall Cofferdam and associated Safe Haven as part of Anchorsholme Long Sea Outfall project. The works were being undertaken by United Utilities and the long sea outfall form part of a £100million investment over the next five years to improve the bathing water quality along the Fylde Coast. The outfall capacity is specifically designed to allow storm waters to flow far enough out to sea to prevent it affecting bathing water quality. At 2.5m diameter and 3.7km in length, the Anchorsholme pipe is not only believed to be the largest diameter and length in the U.K. but also the largest single man-made structure ever to have been transported across the U.K. The 3.7km long superpipe was floated 220 miles across the sea from Northern Ireland. It took 4 years of planning and weighs 20,000 tonnes. Altogether 14 boats were involved in transporting and placing the pipe. 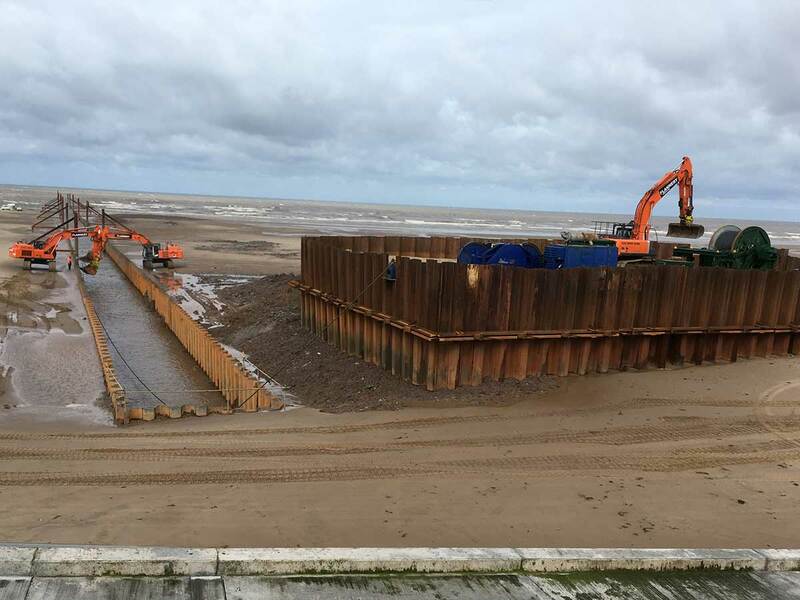 Prior to delivery of the superpipe Sheet Piling (UK) Ltd installed a 525.0m long temporary Pipe Trench Sea Outfall Cofferdam between MHWS and MLWS to facilitate installation of the pipe into the excavated trench. The length of the trench was determined by the limits of the offshore dredging operation and the requirement to mitigate environment impact of the excavation works on the beach. 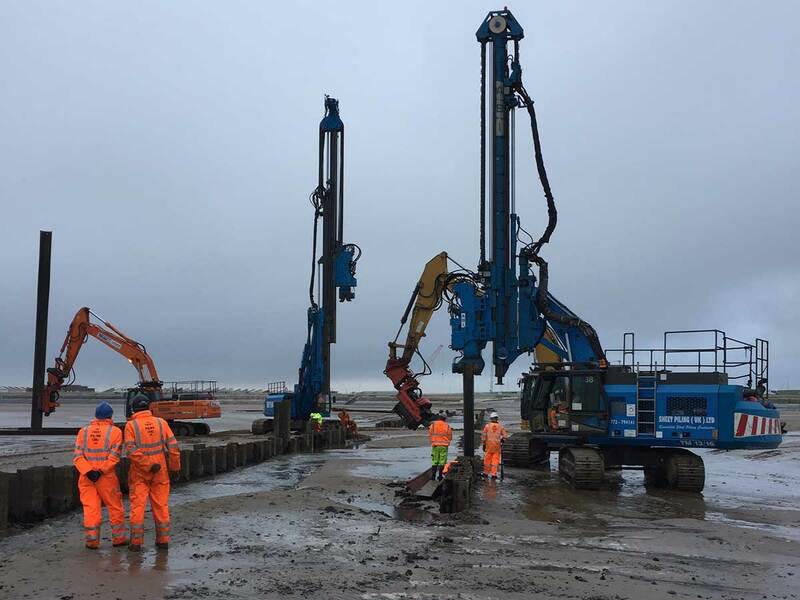 Due to the works being intertidal, close coordination to maximise the working hours on each tide had to be undertaken to achieve the programme. In total two telescopic leader rigs and two excavators with Movax attachments were utilised for the full 8no week installation programme. Ground conditions onsite were very variable and consisted of Glacial Sands overlying very stiff Glacial clays which increased in strength as the works progress seaward. 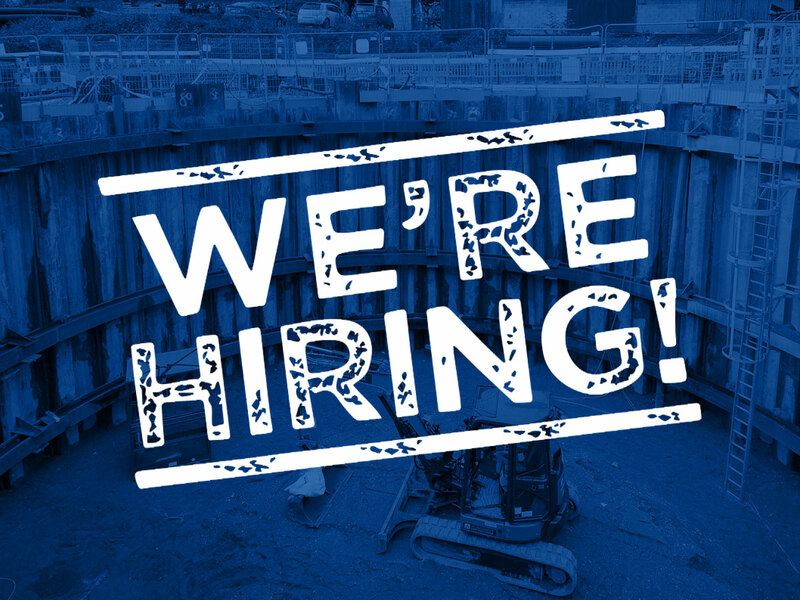 Consequently, an element of preaugering works was undertaken on site to ensure the design pile toe level could be achieved to facilitate a cantilever solution for floating the pipe into the trench and to mitigate pile damage during excavation. In addition to the temporary Pipe Trench Cofferdam approximately 180no 12.0m to 16.0m long Arcelor Mittal GU27 sheet piles were installed to form a 30.0m x 20.0m Safe Haven. 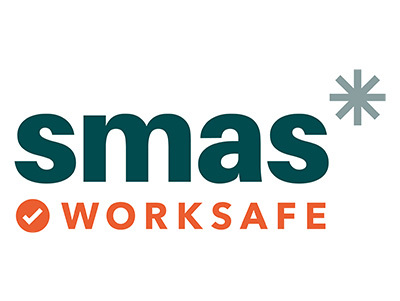 The Safe Haven was located at MHWS and on the Northern side of the trench cofferdam to provide a storage area for plant and equipment during the works and a suitable location for the winch assembly for pulling of pipe into the trench. Unfortunately, during Storm Brian in October 2017, the pipe was damaged with the final 250m being lifted out of the trench and breaking away. Consequently, a replacement section of pipe had to be ordered for Norway and was eventually floated into position in June 2018. Follow on works to permanently secure the pipe using anti-flotation concrete kennels along with joining of the new section of pipe to the existing and backfilling of the trench was then duly undertaken. Extraction of the Safe Haven had previously been completed in December 2017 to prevent any further damage from the winter storms. 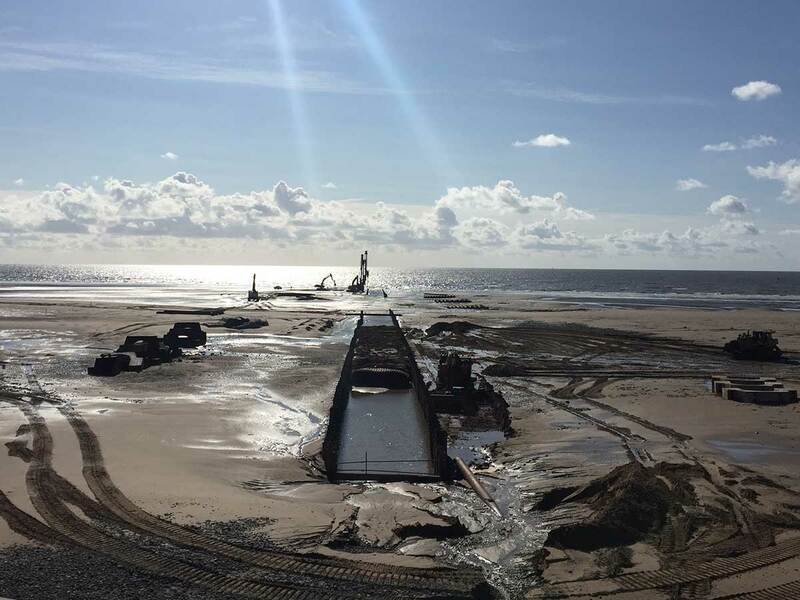 Extraction of the Temporary Pipe Trench Sea Outfall Cofferdam was carried out between August and September 2018. The work was again carried out using two telescopic leader rigs and two excavators with Movax attachments continuously over the 6no week extraction programme. 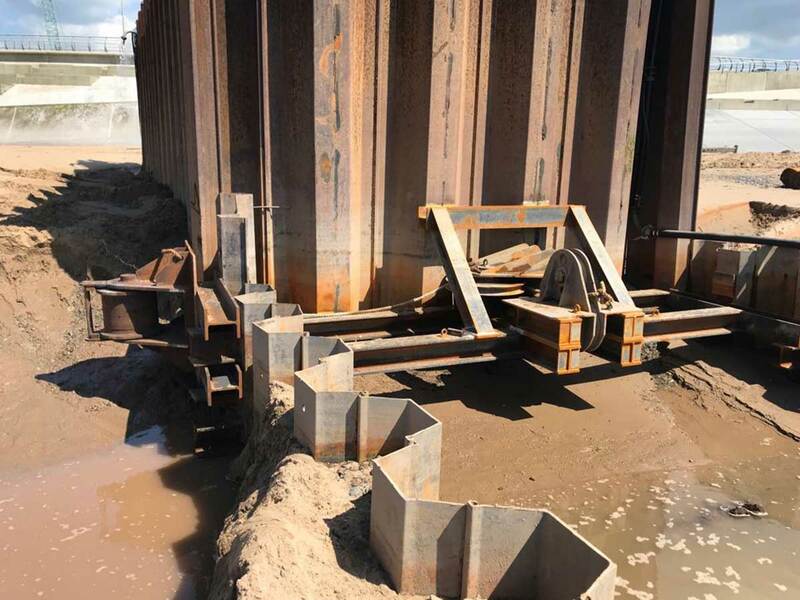 All sheet piles were successfully extracted, and minimal overall pile damage was observed particularly given the problematic ground conditions and duration the piles had been in the ground. 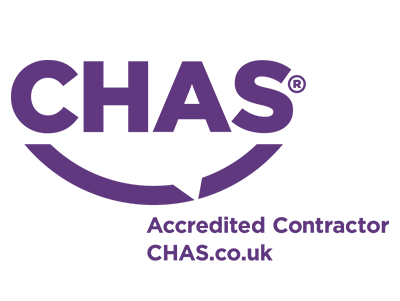 The overall works are scheduled to be completed in October 2018.